The giant desert hairy scorpion is the largest scorpion found in America. 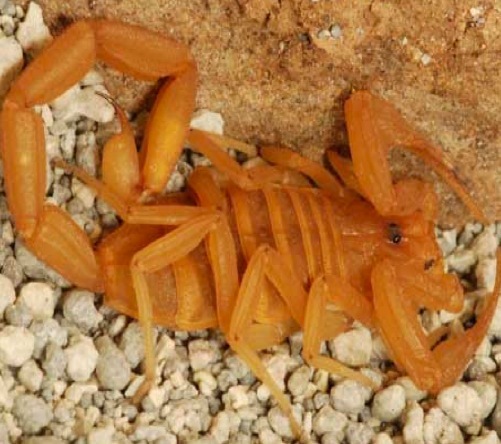 Being twice as large as the bark scorpion at maturity it can be largely found in the desert regions of Arizona and California with Nevada, New Mexico and west Texas following behind. It grows up to 6 inches long and gets its name by the brown hairs that cover the body. 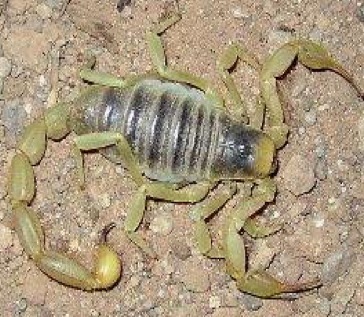 This scorpion is a brownish scorpion with yellow legs and pinchers and has a long tail with a bulb-like poison gland. Not deadly scorpions but their venom is considered mild and has little effect on most humans, but their sting is painful. They are often aggressive and sting frequently. Scorpion stings can really hurt. The hairs help the scorpion detect air and ground vibrations. All scorpions have bad eyesight, good sense of hearing, and touch. They usually eat spiders, centipedes, insects, small vertebrates and other scorpions. As with most dangerous scorpions, this scorpion species are most active at night and wait to attack their prey. They use rocks to keep cool in the hot Arizona desert sun. Here are some steps that can be taken to effectively implement your own scorpion control program. any other objects you consider a shelter for scorpions from around the home or business. Grass must remain neatly mowed (short), especially near the home. Prune all overhanging tree branches and bushes away from main structure of home or business. Minimize low growing ground cover vegetation. Store all garbage containers on a surface or frame which allows for rest above ground level. If you bring firewood inside the building make sure it is placed directly on the fire. Controlling the scorpion food source controls and manages scorpion population. Always remember, cleanliness is your best scorpion pest control defense against any scorpion and any pest. Install weather stripping around all loose fitting doors and windows. Click on arizona scorpions to return to our scorpions homepage. Keep door and window screens in good shape and proper repair. They must fit tightly into the door and window frames. 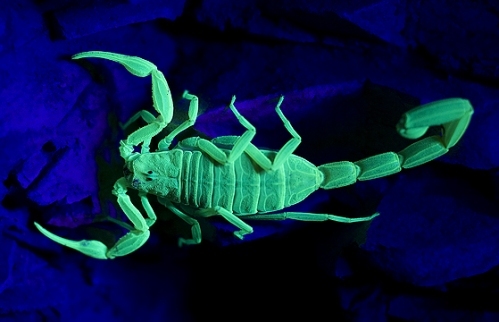 Because scorpions glow under ultra violate light they are easy to find with a little help from a black light during the night and in very dark places. This is actually pretty fun! You just have to make sure you are wearing high top boots and long tongs. Collect all scorpions using long forceps or tongs; keep them in a sealable and sturdy container. Dispose of them into solitary desert (a desert scorpion is useful when it remains in the desert) or you can just kill them. Tube can then be replaced with an ultraviolet bulb. A more powerful system will allow you nighttime scorpion viewing from 4-5 feet away. The Approximate cost is about $200. Please check back with us for more scorpion facts, and other tips on other types of scorpions and how to control them. But if you don't want to have to do all the work that it takes to remove the Desert Hairy Scorpion, please contact us and Atomic will do all the heavy lifting for you!